Preparing for a panel interview is slightly different than other interviews. 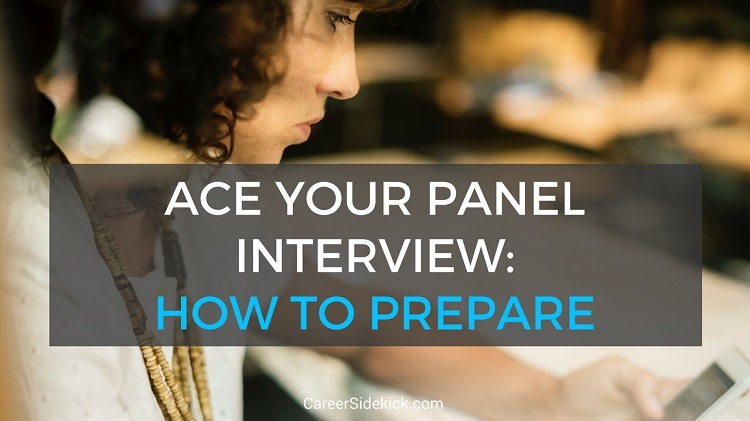 Some steps are the same, but there are a few extra areas to focus on when preparing, so I’m going to walk you through how to prepare to ace your panel interview from start to finish. When preparing for your panel interview, you’ll want to cover all of the typical interview preparation steps for any interview – like researching the company, reviewing your resume, coming up with examples and stories you can share to highlight your past accomplishments, etc. Yet there are some additional things you should do and keep in mind if you want to ace your panel interview and walk in fully prepared for this specific type of interview process. So let’s look at the areas to spend extra time focusing on and preparing for with panel interviews. Be ready to maintain eye contact with the whole panel, with slightly more attention toward whoever asked the question you’re answering. And practice your body language in general – eye contact, posture, keeping your hands and feet still (not tapping), etc. If you don’t feel confident or don’t have good body language habits, it’s going to become a bigger problem in a panel interview or group interview because it’s more pressure, more people to make eye contact with and interact with, etc. It’s important to ask a lot of questions in a panel interview. So a big portion of your effort in preparing for the panel interview should be writing down great questions to ask them. I recommend bringing the questions in a notebook and just ask the interviewer if it’s okay to bring it in with you. 99% of the time they’ll say “yes”. When you ask your questions, you can direct a question to a specific person or the entire panel. How many questions should you ask in your panel interview? I’d say you should take the total number of people on the panel, and then add 1-2 to that number. That’s how many questions to ask. So if the panel is 4 people, prepare 5-6 questions. If you want to prepare to ace your panel interview, you should spend some time learning as much as you can about the people on the panel. How many people are you meeting with? What are their names and job titles? Then do some research on LinkedIn and find out what type of background these people have. Do they have a more technical background? Is it mostly people from HR and non-technical areas? Does anyone on the panel have the job title you’d have if they hire you? (e.g. someone who is your peer?). And who are the more senior-level people on the panel, such as your future boss? All of this will help you feel more confident and relaxed in the interview, and give better interview answer. So don’t neglect this part of preparing for your panel interview. Note: Treat everyone the same in the panel interview. Just because one person is “lower” in the company does not mean you should act any differently or address their questions any differently. In fact, this is good advice for any interview process, and it’s something we recommend in the advice across our site. Why? Because you never know who the hiring manager is going to ask an opinion from before making the yes/no decision on whether to hire you. This includes the receptionist too! This is a simple and easy way to look prepared and make sure everyone in the panel interview is familiar with your background or can quickly catch up at the start of the meeting. So when you prepare for your interview, print out enough copies of your resume so that you’re sure you’ll have enough to hand out at the beginning. In fact bring a few extras in case someone unexpected joins the panel. Sure, they might have copies already. That’s fine. Do this anyway; it’ll make you look great. Earlier I mentioned you should bring a notepad with questions to ask. Well, you can write your own notes too. You’re going to be taking in a *lot* of information in the typical panel interview so this is important. You’ll need to remember key facts about the position when you follow-up, when you ask questions later, and when you prepare for future interviews or discuss the role further. So take notes, but remember one rule: I call it the 90% rule. Maintain eye contact 90% of the time throughout the panel interview. That means less than 10% of your time should be spent looking down or taking notes. Don’t do more than this ratio or it’ll disrupt the flow of the interview and hurt your chances at getting the job offer. Do your best to build a connection with as many people in the panel interview as possible. Find common areas of interest when preparing for the interview, share stories, mix your questions into the interview instead of just waiting until the end (this makes it feel more like a back-and-forth conversation, and less like an interrogation). Also make sure to learn everyone’s name, and use their names in the conversation. Remember in any interview, and especially a panel interview, they’re not just evaluating your skills and experience – they’re looking to see how you’ll fit in with the current team, company culture and more. This is also a reason researching the company when preparing for your panel interview is so important…. because you can learn about their current team, company culture and more on their website and social media. Then you can use this information to build a stronger bond and show them the traits they’re looking for. But you can’t do that if you don’t research the company when you prepare for the interview. If you follow the tips above and have a general understanding of how to answer common interview questions, you should be in great shape to ace your panel interview! Shake each person’s hand and thank them for their time. Get business cards from each person you met so you’ll have their names and emails to follow up. Then ask them who will be in touch about next steps, and how long it will take to hear back. That way you’ll know when to follow-up after the interview, and who to get in touch with if you have questions. Also, make sure to send “Thank you” notes the day after the interview. You should send an email to each person you met with.